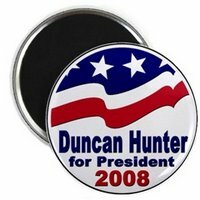 TheTownCrier: Duncan Hunter wins Ariz. GOP insider poll! California Rep. Duncan Hunter won a Phoenix, Ariz., straw poll of GOP insiders. Sen. John McCain finished fourth in his home state and was named the most unacceptable presidential candidate. MANCHESTER, N.H. – When the Rev. John Cerrato got the call asking if a congressman named Duncan Hunter could attend services at Cerrato's Baptist church here, he was understandably squeamish about turning his sanctuary into a presidential campaign zoo. Rep. Duncan Hunter But when the campaign worker on the line assured the pastor that the San Diego-area lawmaker only wanted to worship on a recent Sunday, Cerrato agreed. Besides he'd never heard a whit about this man who is conducting a long-shot bid for the Republican presidential nomination next year. It was Hunter's first trip to this early-primary election state, a place that tends to quickly separate the presidential wannabes from the contenders, where a respectable primary showing can translate into national name recognition and momentum. At the moment, the congressman is a decided dark horse, having won a mere 1 percent of support from Republican voters in recent national polls. Q: Out of the candidates that are mentioned for the White House 08, which one is the most conservative (both fiscal and social)? Why? A: Probably Rep. Duncan Hunter of California. He’s solid on the right to life, even introducing legislation to overturn Roe v. Wade. He was instrumental in getting a border fence built in Southern California during the Clinton administration and has championed an enforcement first approach to immigration reform. As a veteran and former chairman of the House Armed Services Committee, he has a unique understanding of the post-9/11 world we are facing and he has had the courage to challenge the conventional wisdom regarding trade with communist China.
" Duncan Hunter, a California Congressman, was the former chairman of the House Armed Services Committee. He opposes amnesty for illegals and receives a grade of B+ by ABI. He is pro-life, pro-values, and pro-religion. He also is a harsh critic of free trade and our trade deficit, which could be his selling point. He currently has a son, a Lieutenant in the Marines, serving in Iraq. "